Following a hectic summer it is now time for some news updates. We are delighted to let everyone know that Mark Evans, from Blaenau Ffestiniog, has accepted an offer to join Llyn guides. As he has been fishing since he was atoddler he is a very experienced angler. 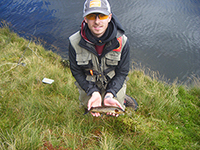 He is an international fly fisher, being a member of the 2015 Welsh Fly Team and is currently taking part in trials for a place in the 2016 team. As a Ranger at Llyn Brenig he is a respected member of staff. He already holds basic qualifications as an angling instructor, in addition to having an appropriate first aid certificate and child protection clearance. He is currently working toward obtaining his APGAI qualification. We look forward to some exciting times ahead – watch this space! Whilst continuing the fight to protect and preserve Welsh fisheries the Campaign To Protect Welsh Fisheries, a voluntary body, was unsuccessful in the Trout & Salmon pitch for funding. Whilst the work will continue, this is obviously not going to make it easy to obtain a high level review of the various reports, relied on by Natural Resources Wales, in coming to a decision to close most hatcheries in Wales. The Monday Club Syndicate has a couple of vacancies at present. Anyone interested should contact Noel at llynguides@dnetw.co.uk The Club has a beat on the river Tanat, with some reciprocal sharing with the Bala Anglers Association and the Denbigh and Clwyd Club. In the late 80’s I spent some time with the Irish Fisheries Protection boys. Whilst they could exercise their powers up to 200 miles off the Irish coast they were unable to stop a major commercial salmon “poaching” operation. 10,000 yards of netting dropping to a depth of 90 feet were laid in the path of returning salmon. Looked after by three trawlers they were untouchable. I mention this for two reasons (1) this is and has had a greater impact on our salmon than anyone realises and (2) commercial poaching continues today. There is an international black list of trawlers which are responsible for a global business valued at $10 billion in annual sales! Amongst the fish taken will be salmon. Interpol has a Purple Notice (i.e. Most Wanted List) in existence for five ships, one of which has now been sunk, but governments are reluctant to commit funds to resolving this problem. Why not? Ever been caught out by unexpected tidal movement which have not been forecast? It is scary when this happens – the voice of experience! Perhaps you misread your tide tables, or might it have been a storm surge? You can now check in advance by visiting www.ntslf.org Stay safe, please!